I love the opportunities a good blog tour gives to discover new patterns and designers as well as meet other bloggers! 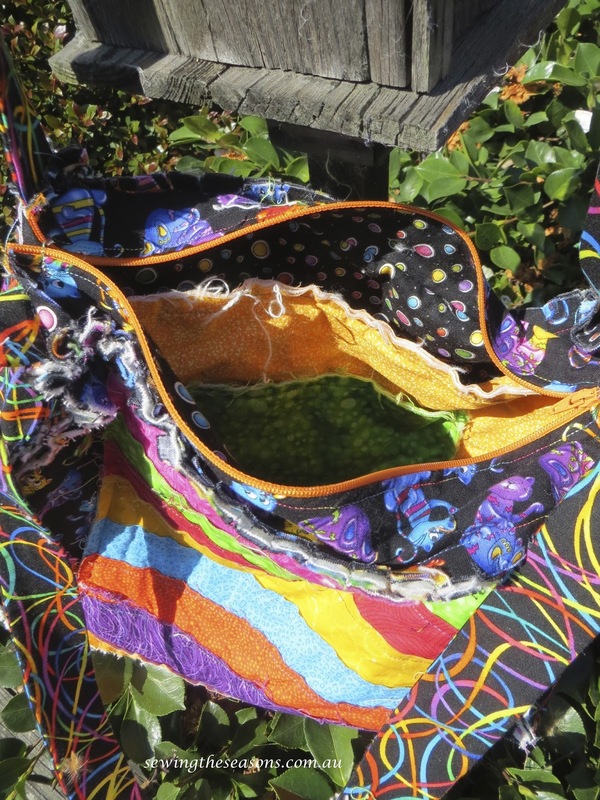 I was recently able to try out the Lexi Lou Rag Bag designed by Bobbi from A Vision to Remember. This bag is different to others I've made as following the 'rag' effect (i/e/ seams to outside, soft, fluffy finish) it was a quicker sew. As soon as I saw the pattern, I knew this one would be ideal to use up some of the bright fabrics I have stored in the collection. Here is the bag finished prior to clipping the exposed seams, washing and popping into the dryer to encourage the 'fluffed' finish to happen. The bag includes a zippered closure across the top giving added security when out and about. Inside the bag there is one large internal pocket with a smaller pocket attached to the front of it allowing for phone storage as well. Here is a close up of inside the bag. 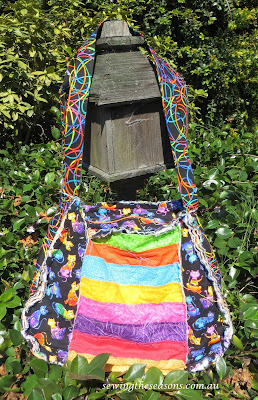 I chose to make mine with out any stiff interfacing (option given in the pattern to include or not) as I felt the bag lent itself to a softer, floppier look. The bag is surprisingly spacious and the strap length means it sits well over the shoulder. Why not pop on over to the other blogs on the tour and check out their bags as well. Join seven seamstresses as we sew up the New Lexi-Lou bag from A Vision to Remember. There will be one or two bloggers each day, be sure to visit them all as no two bags are the same! *NOTE* The links below won’t show the tour posts until their day of the tour, but you are encouraged to click through and check their blogs out. Be sure to leave a comment each day to be entered to win a free pattern. Each blogger will be choosing one comment from their blog to receive a free pattern from A Vision to remember. Also, the Lexi-Lou Pattern has been discounted 25% this week! Get yours now on Craftsy or Etsy! 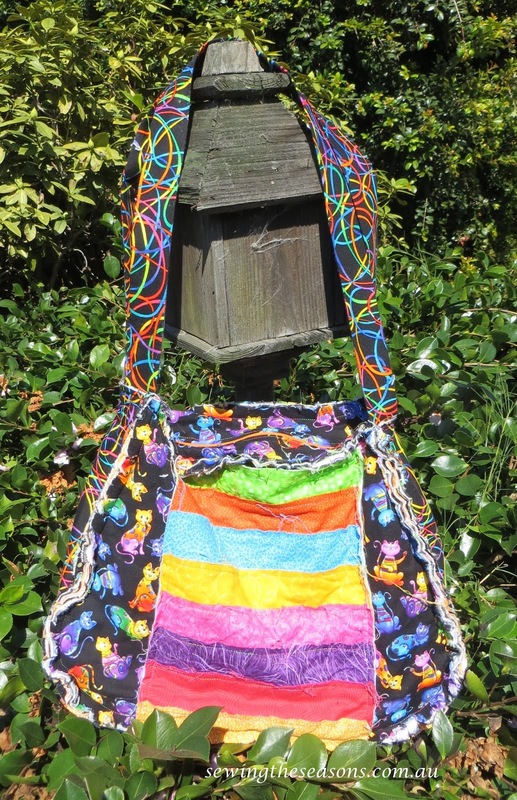 I love the bright colors of your bag! Great job! Oh my goodness! That main print is simply lovely! Such a fun bag! I am loving the star gazing quilt pattern. Thanks for popping by Jona, yep it's a fun bag. Yours is very pretty, I love your fun bright colors against the dark background! Thanks for popping by Meriel, the colours sure do pop.